$249.00 is the price for the Bertoia Counter Stool from www.gibraltarfurniture.com. (800 416 3635) This store is furniture nirvana for people who want Bauhaus, art deco, modern, mid century, or designer furniture at wholesale prices! DWR offers the same piece for $855. The main difference is that the official Knoll release comes with a certificate of authenticity and our reproduction does not. $399 is the price for the Bertoia Bar Stool from www.gibraltarfurniture.com. (800 416 3635) This store is furniture nirvana for people who want Bauhaus, art deco, modern, mid century, or designer furniture at wholesale prices! DWR offers the same piece for$747.00 – $970.00. The main difference is that the official Knoll release comes with a certificate of authenticity and our reproduction does not. $275 is the price for the Bertoia Side Chair from www.gibraltarfurniture.com. (800 416 3635) This store is furniture nirvana for people who want Bauhaus, art deco, modern, mid century, or designer furniture at wholesale prices! 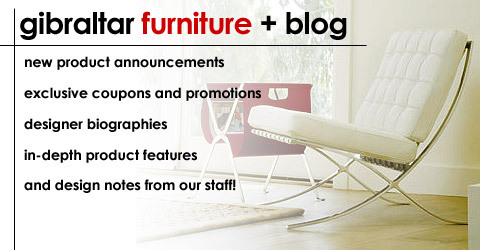 DWR offers the same piece for $421.00 – $593.00. The main difference is that the official Knoll release comes with a certificate of authenticity and our reproduction does not. $299 is the price for the Bertoia Wire Diamond Chair from www.gibraltarfurniture.com. (800 416 3635) This store is furniture nirvana for people who want Bauhaus, art deco, modern, mid century, or designer furniture at wholesale prices! DWR offers the same piece for $877. The main difference is that the official Knoll release comes with a certificate of authenticity and our reproduction does not. Gibraltar Furniture (800 416 3635) offers the lowest priced and highest quality, Barcelona chairs in the world. Prices start at $795 for a 100% imported all Italian leather classic. This modern masterpiece can be produced in a dazzling array of leather options and is offered by this Beverly Hills design company located at http://www.gibraltarfurniture.com. The Barcelona chair and ottoman set was designed by the legendary modernist architect, Ludwig Mies Van Der Rohe, for the German pavilion at the 1929 International Exhibition held in Spain. The Barcelona chair and ottoman has become an icon of important chair design. This legendary design resulted from a partnership between the famous Bauhaus architect Mies van der Rohe and his long time associate and companion, the architect and designer, Lilly Reich. Only recently have the contributions for Reich been acknowledged. The Pavilion or Barcelona chair is an icon of the “modern classical” style. Its design was inspired by its predecessors, the campaign and folding chairs of the Pharaohs and the Romans. Our Barcelona chair and ottoman set is an ultra high quality product using premium solid-core stainless steel flat bar which is hand-made using classic welding and bending techniques. Our frames are NOT made using lower cost carbon steel, which may be chrome-plated hollow tubes and then bolted/screwed together. Multiple colors and grades of premium top grain Italian leather are available for your design requirements. Each square of leather is hand selected, piped, tufted and individually sewn by expert leather craftsmen. Three types of highly resilient foam are used to provide the proper amount of plush comfort and firm support. The cushions rest upon a suspended network of saddle leather belt straps. We created our Barcelona chair with great ergonomic attention. With good lumbar support, this is the most comfortable Barcelona chairs in production today.